New Music New College Director Professor Stephen Miles has been intrigued by the concept of music as a means of making social space—and the inverse idea, using social interaction as a process to create music—ever since he witnessed the audience response to NMNC's first offering, the John Cage Song Books performed in such a way that audience members were able to choose their individual receptive experiences. For the Cage five performers moved throughout gallery space in Sarasota's Ringling Museum of Art in five individual, pre-planned paths during the hour-long piece; audience members were invited to move around or stay where they were, as each desired. The thrilling part was that there was no one way everyone reacted. Some people stayed in one place for a while, others followed one or another performer, and still others meandered through the galleries, looking at the art; most people did a combination of all three. But because the audience space was not fixed, with rows of seats set apart from the performers, audience members created a social space, interacting with each other as well as with the art and the performers. 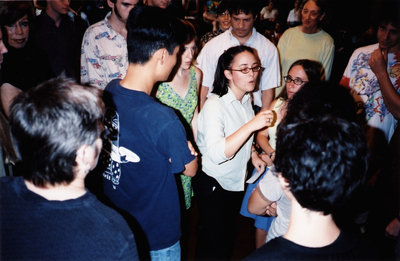 The following year (1999) Miles led a group of students in NMNC's second performance, five of Pauline Oliveros's Sonic Meditations, also performed in the Ringling Museum, but this time in an exhibition of installation art entitled "Blurring the Boundaries." Again there was no fixed "audience" space, but this time instead of wandering the audience remained in place, dispersed throughout part of the exhibition space, for the first two pieces. After demonstrating Meditation XV ("Zina's Circle"), in which a circle of performers holding hands "pass" a pulse of sound around the circle, everyone was invited to join the Meditation, and a much larger circle snaked around the entire space. So in this way the physical space and the social space combined as scores of people created one music-making organism. Miles wrote a paper about the project, "Objectivity and Intersubjectivity in Pauline Oliveros's Sonic Meditations" in Perspectives of New Music, Winter 2008, 46:1, 4-38. You can access it here through JSTOR. In 2002 Miles began a project, working with a group of New College students, to explore the implications of compositions created to reflect the social dimension of musical performance. He wrote a number of musical "games" he called Social Studies. As Miles writes, "Each of the Social Studies games uses a specific social dynamic as its generative principle. Each game consists of verbal instructions, essentially a set of procedures. The performers themselves must contribute material and participate in the compositional process." This process culminated in a concert in College Hall in March of 2003, The Social Studies Project: An Experiment in Composition and Performance. Twenty-one students, as well as Miles and NMNC Producer R. L. Silver, performed five of the games, including one each by student Audrey Troutt and Silver. The social and spatial aspects of composition were evident, especially in Miles's Affiliation, the final piece, which began with performers dispersed throughout the three ground-floor rooms of College Hall. The piece began with each singing a quiet tone, then listening to others' pitches and grouping (affiliating) if the pitches were the same, or slowly agreeing on a midpoint if they were not. As the piece progressed over a twenty-minute span affiliated groups got larger and coalesced in the central room, until at the end everyone was in unison. Here is a video about the piece with some excerpts from the performance, and here you can read a paper by Miles about the theory and the processes of devising and realizing The Social Studies Project in Music & Arts In Action. Following quickly on The Social Studies Project, Miles initiated an experiment in collaborative composition with five students, known by the moniker, XMG (eXperimental Music Group). Working over a period of seven weeks, XMG followed Sol Lowitt’s dictum, “The idea is the machine that creates the art,” and elaborated the concept of “mediation” into a work for two vocal ensembles, Hocket Science. The basic idea of Hocket Science is that two equally-numbered groups, spatially isolated from each other and singing different material, eventually converge and modify their respective material through a group of conversational duets, then return to their groups and spaces, and combine identical melodic units into two different melodies. The score is shown at the bottom of this page. 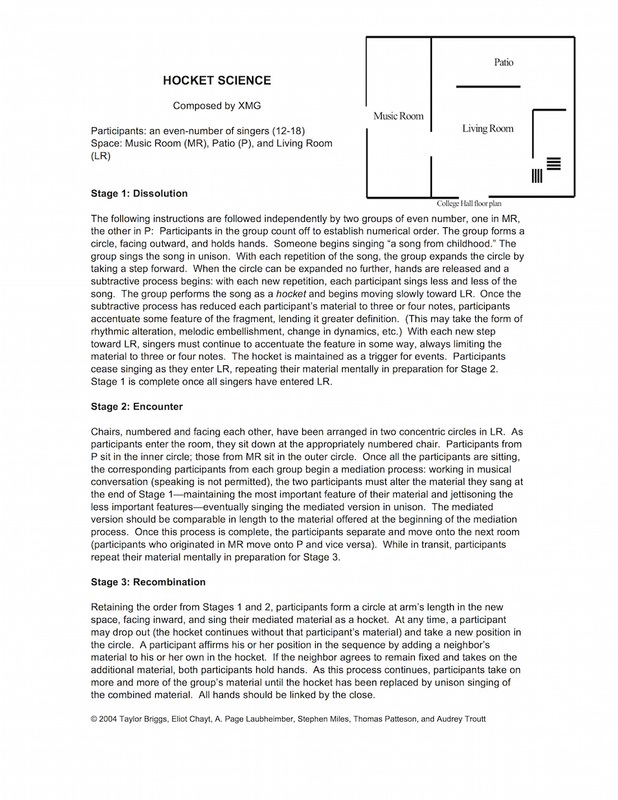 Miles published an essay on the project, “Experimental Music and Communicative Action,” in which he grounds the process of composition, performance and reception in Jurgen Habermas’s theory of communicative action. 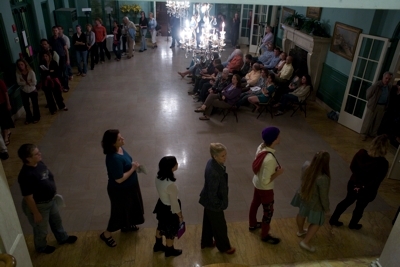 Miles worked with New College students in 2008 on a series of pieces called Playspace, and this also led to a concert utilizing the entire ground floor of College Hall. After two pieces in the Music Room, including Following from Social Studies, the performers and audience moved to the other two rooms. First all who were interested in joining performed Pauline Oliveros's The Slow Song by forming a huge circle and walking slowly counter-clockwise as each person quietly and slowly sang a song that had some personal meaning. The concert concluded with Miles's Linkage, wherein performers start with individual chosen pitches, link up with other performers to form phrases from these pitches, then further link up with other groups to form more and more complex melodies. Once a group chose to consider itself complete, it left College Hall and proceeded down to the bayfront. New Music New College has explored the use of space and social interaction in music-making in may other concerts, as well: in all our Crossroads concerts, in our 2010 performances of the Song Books, and in our presentations of Cornelius Cardew's The Great Learning, Paragraph Seven. And in November of 2015 visiting artist Miya Masaoka created a sound installation in New College's Jane Bancroft Cook Library, A Long Way to F#—a circle of speakers with slowly converging tones. People reacted to the installation in many different ways—some walked or jogged around the circle, changing their direction periodically; some stood in the middle or outside it altogether; and some even took laptops or books and sat in the middle while they read.